Last week, Cartoon Sara was kind enough to share her comprehensive and well-researched list of favorite Christmas Specials. 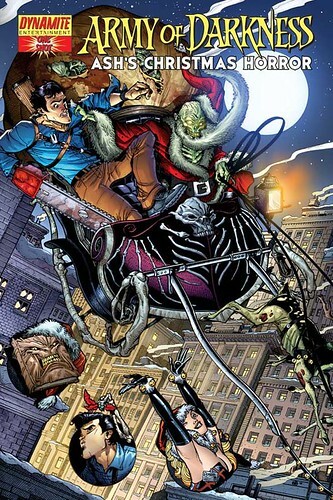 This got me thinking about some of my favorite holiday themed comic books and stories. Limited a bit by availability (as in online and in my house), here is a quick sample of just some of the comics out there for those of us in search of a bit more holiday (and in some cases I use this term loosely) cheer. Story: Hellboy fulfills a dying woman’s wish as he goes to deliver a gift to the woman’s daughter who disappeared years ago. 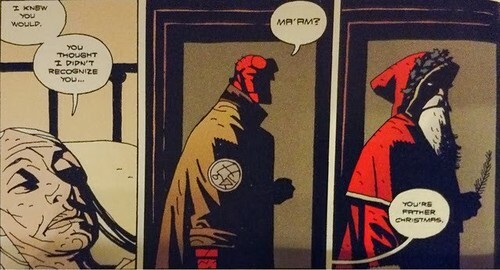 Readability: Um, it’s Hellboy. Do we really still need to get into this? Fine. Reprinted in Volume 3: The Chained Coffin and other Stories, this was actually a quick story from a Hellboy Special printed in December 1997. It’s short and its not very Christmas-y , but it does just once again prove how good Mignola is at simple storytelling and creating atmosphere, and if it results in you reading more Hellboy (or even re-reading a whole bunch more like I did) well then it’s a win-win situation all around. Story: On Christmas Eve , Deadites stage an assault on S-Mart and on all the shoppers who stayed at the store late to see Santa and partake in the holiday sales and crappy promos. Ash springs to action, hilarity ensues. Readability: A 2008 one shot, this is not a big lift by any stretch of the imagination. A basic knowledge of the Evil Dead series is helpful, but I think the idea is mainly to enjoy the over -the-top violence (evil Santa is impaled by a zombie reindeer) and smirk at all the in-jokes as Ash finds himself traveling through worlds themed as some very well-known Christmas specials. All-in-all, this one is probably a lot more fun for those who are big Evil Dead fans than not. Story: A retelling of the Dickens classic…with zombies! Only this time, Scrooge himself is patient zero. 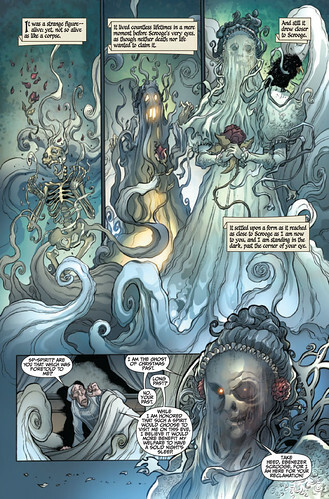 Readability: A five issue excuse to draw Victorian zombies, I just didn't really get this one. It reminded me of Pride and Prejudice and Zombies. The concept is cute for about 5 minutes and then the rest feels forced. Part of it might just be zombie fatigue, but finishing this one was tough. There might have been some skimming… However, I am willing to admit that if you are both a huge zombie fan and a huge Dickens fan (I know you are out there), you might find this one fun. Story: A compilation of Batman stories from the Animated Series universe (all but one were adapted for the New Batman Adventures Series episode Holiday Knights). Stories range from heartbreaking to hilarious. Readability: Perfection. Really. Worth the price of admission for the Harley and Ivy story alone. I could spend the rest of this review gushing about it and how much I loved it and how it made me giggle like a cat-eared girl in some crazy anime. ..but that would take away time you could be spending trying to hunt this issue down or just watching the episode somewhere. God speed my friends, and good luck! Story: The Easter Bunny hires Lobo to take out Santa, who has grown too powerful for his fuzz-trimmed britches. 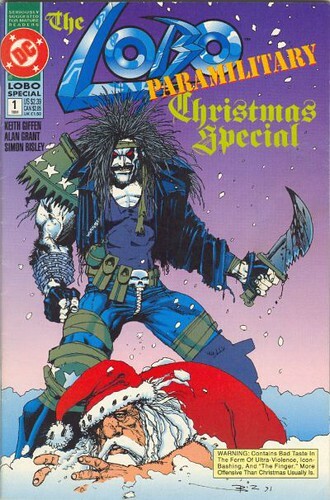 Readability: When discussing this article with a friend, he pretty much told me “All Christmas comics begin and end with Lobo.” And he was right. This one is epic and contains the sort of insane violence one has come to expect from a Lobo story. And through all the severed limbs and cascades of blood and bullets, the dark and rather twisted humor is still there. While I realize this might not be everyone’s cup of tea, this story certainly has amazing staying power. So how's that for ya? Got you into the spirit of the season yet? No? Well, use the comment section below to make some extra recommendations or to scold me for missing one of your favorite books.